The central portion of the front flap is shown here partially cleaned, but still un-restored. There is extensive damage to this part of the decoration, but it seems much less serious when seen under UV light at the top below. 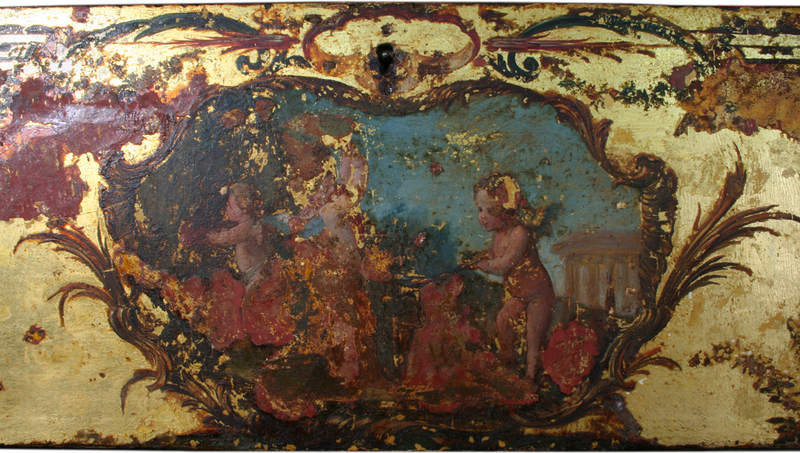 It clearly shows the same putti as those engaged in the rest of 'The Triumph of Love' sequence around the cheek, bentside and tail. This shows the first step in the process of, eventually, returning the victim taken by the arrows in the last of the bentside sequences. The figure at the left is holding the arrow in the forge with a long pair of tongs. 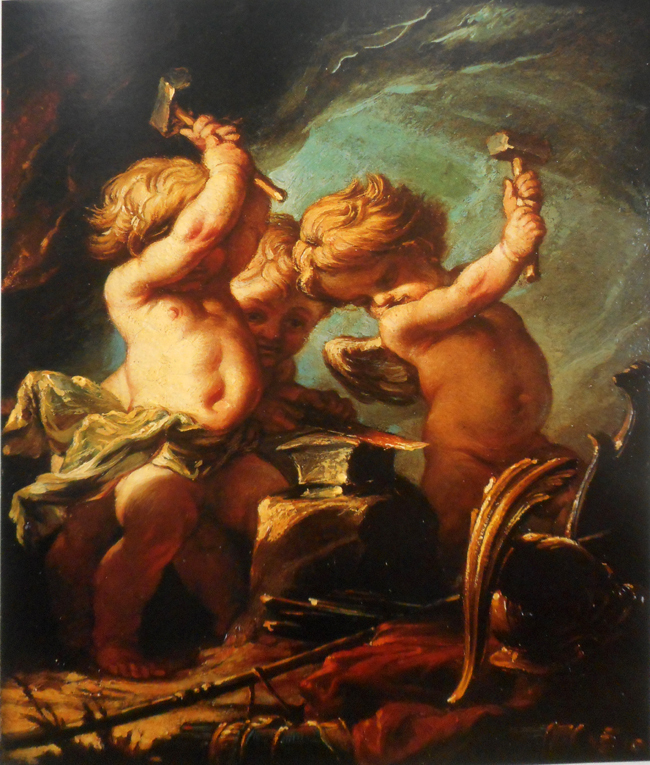 The figure on the left is holding an arrow head on an anvil while the central figure weilds a heavy hammer to shape the arrow correctly. This is, however, a fairly common theme of Boucher's oeuvre as seen in the two bottom images below. Les amours forgerons, by Francoise Boucher, c.1737. This image is taken from the book Francois Boucher. A loan exhibition for the benefit of the New York Botanical Gardens, November 12 - December 19, 1980, (Wildenstein, New York, 1980) No. 30, p. 68. 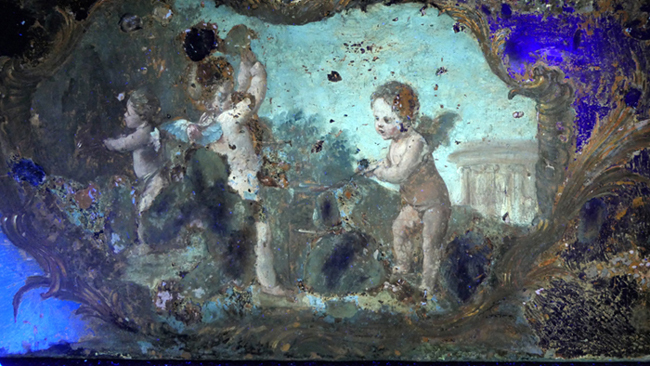 Here the putto at the forge is missing and there are two putti wielding hammers and one holding the piece of red-hot iron. From the Sale Catalogue, Les amours forgerons, Lot 40, HÔTEL DES VENTES DE NEUILLY, 19-12-2013, Paris. 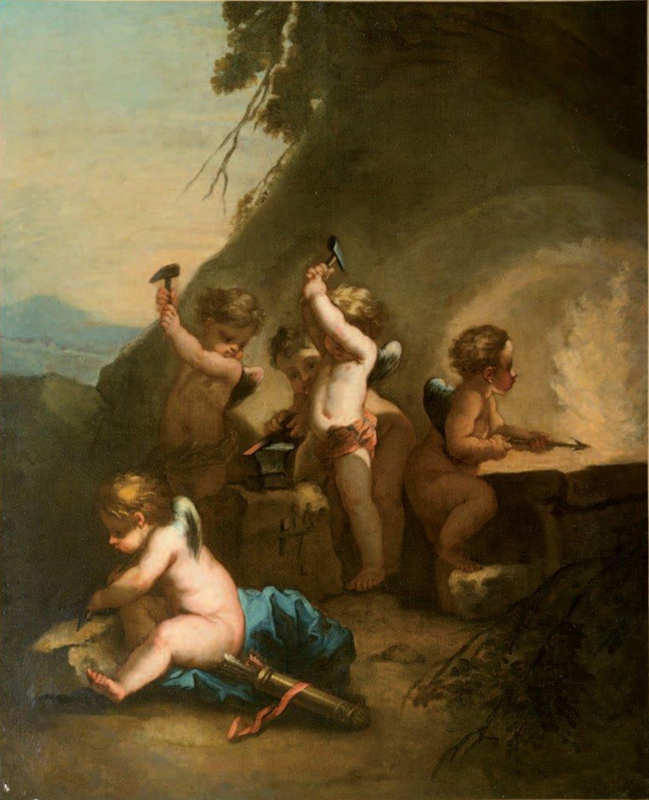 Here a quintet of putti are hard at work making arrows: one is heating an arrow at the forge, three are engaged in forming the arrowhead at the anvil, and one is sharpening the arrow on a stone. These five figures combine the two first images on the harpsichord - the front lockboard and the sharpening scene on the cheek. The painting on the front flap has been done in oil, and is painted on a ground of thick gold leaf. This type of decoration was known in the eighteenth-century as ‘vernis martin’ after the Martin brothers who invented and developed this luxurious type of furniture decoration. The putti in the other paintings of the 'Triumph of Love' on the cheek, bentside and tail are remarkably similar to a number of paintings by Boucher in various museums and galleries throughout Europe and North America.